We treat patients who've taken IVF treatment in many other IVF clinics from all parts of the world. While some of them have received excellent clinical care, some of them have some horror stories to share. There are leading IVF doctors who extort money from the patient by demanding a huge amount of payment in cash just before the egg collection. Patients are vulnerable and scared that the doctor will not do the treatment properly if they refuse to pay, which is why they are forced to cough up. This collection of money under the table from the patient is a cash transaction , which is not documented or authorized. Now the patient is too scared to challenge this at the time of the treatment, but it always amazes me why they do not complain more vocally about this kind of malpractise after the treatment cycle. 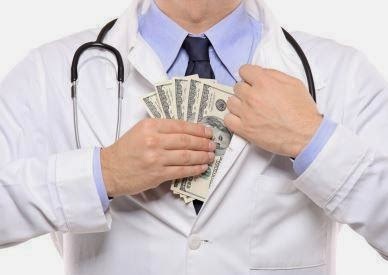 How can you expect a doctor who takes money under the table to be ethically upright or honest. If he is willing to cheat the Government, why will he not be willing to cheat you as well ? In order to maximize his income, he may do all kinds of dodgy stuff, such as “donating” your eggs to another infertile couples – or using donor sperm for you , without informing you, in order to maximize his success rates and their profits. How can you trust someone who does illegal transactions ? While it’s sad that even leading IVF specialists , who are extremely well-off , indulge in these malpractises, what amazes me even more is that patients are willing to comply with these unethical and illegal requests ! In this day and age, when it’s so easy for articulate patients to complain about unethical doctors , why are they willing to be accomplices in these shady transactions ? Doesn’t this mean that it’s the patients themselves who are contributing to the problem ? It’s easy to justify this by saying that patients are helpless and don’t really have a choice , but this is simply not true – especially in an area like IVF , where there are so many choices available to the patient . If the patient is willing to go to a doctor who asks for money under the table , and then not complain about this , then I don't think the patient should complain when they get poor quality care . This is just the tip of the iceberg . These clinics force their patients to buy their medicines from a particular shop - or do all their tests from some private laboratory ( which provides kickbacks to the referring doctor). Most IVF patients are very resigned to waiting for hours to see the doctor; or have accepted the fact that the “brand name” doctor ( for whom they go to the clinic) is never available – and that their care is provided only by nurses and assistants. patients , in front of them . This is not my idea of good medical care , but this happens routinely in many high profile IVF clinics ! I guess it’s because these clinics are run by doctors who are very famous , that they can get away with this kind of behavior. Patients fall into line, because they believe that if this is the way all other patients are being treated, then this is an accepted part of the system , and they have to go along with this. Why aren’t patients willing to be more articulate and to complain ? If they do not speak up, these practices will continue to spread – and this will harm other patients as well. By emailing mute, patients are serving as partners in crime, and doing a major disservice to the entire community. It is this deafening silence which contributes to the sad state of medical practice in India today. The only reason doctors can get away with this kind of atrocious behaviour is because their patients put up with it !